Software AG has bought its German IoT cloud service provider partner Cumulocity in a further indicator of consolidation in the IoT market. Cumulocity offers connectivity for networked digital devices and sensors through a cloud-hosted IoT device management and application enablement platform. Embedding Cumulocity’s IoT solutions into Software AG’s portfolio allows enterprises to integrate their IT applications with operational IoT devices – providing maximum ease of use, flexibility and ultimately business value. For Software AG, the acquisition of Cumulocity is a further step in the expansion of its technology leadership in the IoT area, following the successful acquisition of the artificial intelligence company Zementis in December 2016. Financial details of the transaction were not disclosed. Software AG embedded Cumulocity’s IoT Cloud Platform into its Digital Business Platform software portfolio two years ago. The combination of the Digital Business Platform and Cumulocity’s Application and Device Management technology reduces the complexity of the Internet of Things and allows the scalable and flexible management of networks of millions of devices. Additionally, enterprises can integrate those IoT edge devices with any existing IT application and deploy other Digital Business Platform software products to those devices. “The successful cooperation between Software AG and Cumulocity started in 2015 in the context of a strategic IoT partnership - the merger is a next logical step. We are convinced that we will be able to accelerate our success story as part of Software AG. Especially our partners and customers will benefit from the merger of both companies,” said Bernd Gross, Chief Executive Officer at Cumulocity. The acquisition of Cumulocity technology completes Software AG’s portfolio of core Internet of Things software services. These are streaming analytics, on-premise, cloud and hybrid – and now IoT device – integration, in-memory technology, dynamic process management and IoT edge device management. It does highlight the challenges of smaller companies providing large scale IoT cloud services and gives Software AG access to Cumulocity's 2500 developer partners. In addition to the acquisition of Zementis, Software AG has announced major, strategic IoT or Industry 4.0 alliances with major corporations in recent months including Bosch, Octo, Dell and Huawei. Now here's an interesting story that combines many of the current trends in power, drones and IoT. A fuel cell technology developed by Intelligent energy in the UK will be used to power drones for longer so that they can spend more time on inspections, all connecting back to the Internet of Things. With FPGAs being used for UAV control and vision systems, and artificial intelligence and machine learning also being implemented on these aircraft, fuel cells are providing the ability for embedded IoT technologies to operate for significantly longer. IBM has teamed up with the Dublin City University (DCU) Water Institute to test out Internet of Things (IoT) technologies for environmental monitoring and management. The deployment of DCU sensors with IBM's machine learning and cognitive IoT technologies will aim to help protect and conserve natural resources and address environmental management issues such as water quality for both freshwater and marine environments. IBM's cognitive IoT technologies are able to provide deep learning capabilities for sensor platforms, which ensure quality and reliable data capture under a range of environmental conditions. Advanced analytics embedded in IoT-based sensor platforms, or the sensors themselves, can help detect subtle trends or early detection of environmental changes. IBM researchers Harry Kolar and Mike Kelly and RPI University researcher Larry Eichler deploy a Dublin City University Water Institute sensor with IBM's IoT technology to help protect and conserve natural resources on Lake George in New York. The collaboration brings together IBM Research efforts in the area of cognitive IoT-based environmental solutions with DCU's Water Institute expertise in environmental sensing via the university's National Centre for Sensor Research (NCSR). IBM and DCU Water Institute will be selectively piloting these technologies in Ireland and in the United States. The first sensors are being deployed on Lake George in New York State in conjunction with the ongoing Jefferson Project at Lake George. "Over the next few years, we believe that Internet of Things technologies will play an important role in helping protect the environment and natural resources. At IBM Research, we are excited to leverage IBM's expertise in cognitive and IoT environmental monitoring and management with the DCU Water Institute to help advance the future of water management," said Harry Kolar, Distinguished Engineer at IBM Research. The collaboration will focus on newly developed DCU sensor technologies that can have the potential for monitoring several key aspects of water quality at costs significantly lower than current commercial technologies. This new generation of sensors, when combined with IBM's environmental IoT platform may eventually help provide significant benefits for water management on a global scale. "The technologies developed during this important collaboration will aim to disrupt the current norms of costly sensors limiting their distribution at IoT scale to provide really valuable information which supports better decision-making about our valuable water resource," said Professor Fiona Regan, Director of the DCU Water Institute. Nexeon MedSystems in the US has licensed a portfolio of IoT patents from Marathon Patent Group. The portfolio of 86 patents originated from Siemens and covers the interconnection via the internet of computing devices embedded in everyday objects, enabling them to send and receive data. The technology can be used in a variety of medical device applications, most notably in hospitals, nursing facilities, or patients' homes. 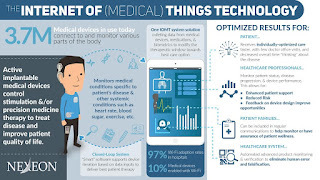 "The data gathered in these IoT systems can be utilized to help improve the programming for implantable devices," said Nexeon Chairman and CEO Will Rosellini. "An average patient with a chronic disease typically takes more than five different medications everyday, most of which need to be taken at different times of the day and have specific dietary recommendations to accompany the dosages. This same patient is typically demonstrating symptoms associated with cognitive, psychiatric, and motor disorders as well. 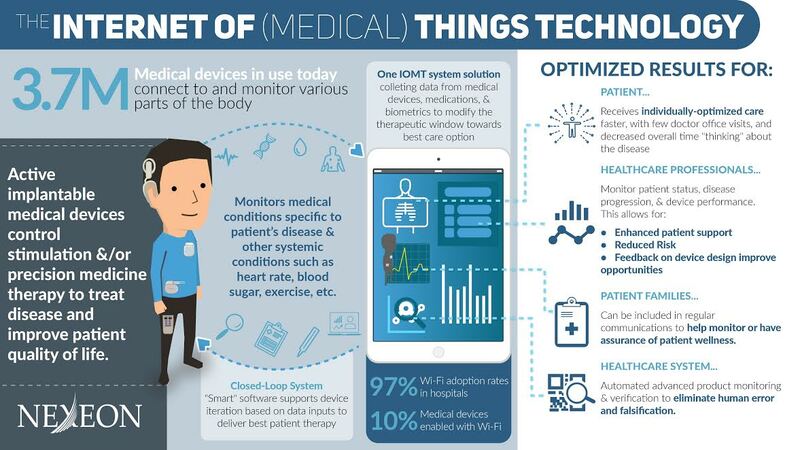 The promise of keeping the device in the right therapeutic range with data from the IoT is extraordinary." The portfolio covers self-healing control networks for building automation systems in the hospital and the home. The patents are relevant to wireless mesh networks for use in the IoT and enable simple commissioning, application level security, simplified bridging, and end-to-end IP security. There is a growing trend in electrophysiology toward remote home-monitoring of implantable cardioverter defibrillators (ICDs), cardiac resynchronization therapy (CRT) devices, pacemakers, and implantable cardiac monitors (ICMs). Nexeon has engaged consultants Battelle to define the data structures and cybersecurity protocols needed to provide the framework for deep learning. "Siemens is one of the most innovative firms in the world," said Rosellini. "Integrating their network innovation with our patient-specific solutions will substantially reduce the burden of chronic disease. By addressing this unmet need, we will create tremendous value in the form of better, faster care with fewer in-office visits required, easier access to more accurate patient information, and decreased complications and undesired side effects due to more precise therapy and better monitoring." A spinout from the University of Michigan has raised $9m to develop 'AI-on-a-chip' in a further demonstration of the move of artificial intelligence into the Internet of Things. The move comes just days after ARM and Xilinx announced strategies fo emebdded AI and other startups such as Imagimob and Graphcore are targetting embedded chips. The company, previously called Isocline, relied on grants and angel investors to develop the underlying technology for its platform and the funding aims to build up the engineering team to develop the chip and software. At a time when data connections are still unreliable and constrained and even children's toys are getting hacked, it is increasingly important to untether the AI in these devices from the cloud to make them more secure, responsive, seamless, and easily integrated. Because Mythic's local AI platform is untethered and inherently more private, device makers, security platform, and monitoring companies see it as being transformative for their products. Mythic was born out of the Michigan Integrated Circuits Lab at the University of Michigan in 2012 – a lab known for its world-class low power chip design and multiple venture-backed spin-outs. Co-founders Mike Henry and Dave Fick developed a new deep learning deployment (or inference) model – based on hybrid digital/analog computation– that eliminates costly processors and transfers the deep learning computations to the memory structures storing the algorithm parameters – all while extending battery life by 50x. This design allows the company to essentially put desktop GPU compute capabilities onto a module the size of a shirt button and data-center compute capabilities onto a card-deck sized platform– offering a new level of trust and security to the growing number of smart devices on the market today. "Other local AI solutions compromise on what consumers and commercial companies care about – battery life, throughput, and accuracy," said Michael Henry, co-founder and CEO of Mythic. "We saw early on the opportunities afforded AI from processor-in-memory technology and new methods of computing outside of the binary 1 and 0 world. This would become a foundation for the Mythic platform that revolutionizes local AI design and performance." Markets that Mythic will be targeting initially include smart home, action cameras, sophisticated healthcare systems, security and monitoring for commercial and home use and drones for industrial applications. Down the road, Mythic sees interesting use cases for robotics, autonomous vehicles, AR, and VR. "Mythic is pushing the performance boundaries of local AI so any device can become a true universal assistant," said Steve Jurvetson, Partner at DFJ. "The way local AI is being engineered today is equivalent to trying to make a propeller plane fly faster by stripping down cargo, or adding 18 propellers – working with technology that stalled just doesn't make sense. Just as jet design put flight on a new trajectory, Mythic is doing the same for local AI." The company is forming engagements with early-adopter customers to field test the technology, with volume shipments projected for mid-2018. The funding round was led by DFJ and includes Lux Capital, Data Collective, and AME Cloud Ventures. German embedded board maker congatec has developed a new cloud API to simplify the development of networks across the Internet of things (IoT). The Cloud API for IoT Gateways highlights the need for equipment suppliers to move up the value chain into the cloud. The API communicates with local smart sensors, processes and converts the acquired data and executes automated actions based on a local rule engine, reducing traffic to the IoT cloud and enabling fast local actions. Secure bidirectional data exchange with any suitable clouds is achieved by using the TLS secured MQTT protocol with a design solution using the Microsoft Azure cloud. Clients can access this cloud via https in client or administrator mode. All these features make the Cloud API for IoT Gateways a simple starting point for OEMs that need to access smart sensor networks via IoT gateways and IoT edge servers. Typical application areas can be found in various IoT segments, from industrial production and machinery to smart cities, smart facilities, smart homes, smart energy grids, medical IoT, the transportation sector and digital signage. The API integrates a broad range of wireless sensor interconnects, including Bluetooth LE, ZigBee, LoRa and other LPWANs, as well as wired protocols for building or factory automation. Even heterogeneous protocol configurations and communication with other gateways are possible. "Each smart sensor network has its own demands. Often, heterogeneous sensor networks are required and various different database implementations can be found in IoT clouds as well," said said Christian Eder, director of marketing at congatec. "At the edge of the IoT we are able to manage these heterogeneous, bidirectional demands by centrally orchestrating local smart sensor networks including the IoT edge gateways themselves. Our application ready congatec Cloud API for IoT Gateways meets this demand. Its freely programmable software modules can be instantly utilized to get access to our boards and their data as well as connected sensor networks. They are available in C++ and can be used as a blueprint for any custom specific implementations. which highly simplifies the development of individual IoT solutions." The main software components are the different Cloud API function modules as well as the demo and test modules for provider independent IoT clouds. The sensor engine of the Cloud API for IoT Gateways makes the communication with the local sensor and actuators independent from any protocol. Additionally, it normalizes the data records to freely definable physical units and checks for consistency. The congatec operating system (CGOS) library integrates relevant gateway system parameters, such as system temperatures, CPU workload and intrusion detection. The rule engine enables the gateway to locally initiate warnings and automated actions if certain values exceed or threaten to exceed a defined threshold. Finally the communication engine takes care of encrypted and provider independent data cloud communication via wired or wireless internet connections. The IoT cloud evaluation software provides the required tools for consolidating the sensor data in the cloud. Additionally, they can establish central messaging and control rules for the connected IoT applications, define further escalation scenarios and provide dashboards for remote clients. congatec provides OEMs with all required software modules in the C++ source code, which simplifies the development of own IoT applications for Linux and Windows based on this application ready reference design and also provides additional software services for the Cloud API and its cloud connection. Implementing analytics in devices at the edge of the network is the only way to prevent security breaches and potential safety threats in the workplace as the Internet of Things (IoT) continues to gather momentum in the home and industrial sector. Current systems only deploy analytics in the gateway, and Chad Boulanger, Global VP, Business Development (IoT Analytics) at Greenwave Systems warns that as IoT deployments increase, data will not be provided quickly enough by this method to make it effective for mission critical applications. To be truly useful, according to Boulanger, analytics really need to be placed at the true edge, in devices, which has been an increasing trend followed by the Embedded blog over the last couple of years. This approach can be applied to IoT technology within any sector, from industrial IoT to the smart home, with its use in the latter protecting customers from security breaches, but it it down to the embedded designers to implement. Greenwave Systems is a global Internet of Things (IoT) software and services company helping companies deploy their own managed services and products. Mobile carriers, telecommunications operators, semiconductor manufacturers, utilities and a wide range of service providers use the Greenwave AXON Platform to integrate data and communications from a variety of existing and emerging digital protocols. FPGA designer Xilinx has launched a suite of industry-standard resources for developing advanced embedded-vision systems based on machine learning and machine inference. Tee reVISION stack and it allows design teams without deep hardware expertise to use a software-defined development flow to combine efficient machine-learning and computer-vision algorithms with Xilinx All Programmable devices to create highly responsive systems. The Xilinx reVISION stack includes a broad range of development resources for platform, algorithm, and application development including support for the most popular neural networks: AlexNet, GoogLeNet, SqueezeNet, SSD, and FCN. Additionally, the stack provides library elements such as pre-defined and optimized implementations for CNN network layers, which are required to build custom neural networks (DNNs and CNNs). The machine-learning elements are complemented by a broad set of acceleration-ready OpenCV functions for computer-vision processing. For application-level development, Xilinx supports industry-standard frameworks including Caffe for machine learning and OpenVX for computer vision. The reVISION stack also includes development platforms from Xilinx and third parties, which support various sensor types. The reVISION development flow starts with a familiar, Eclipse-based development environment; the C, C++, and/or OpenCL programming languages; and associated compilers all incorporated into the Xilinx SDSoC development environment. This will also use the Khronos Group’s OpenVX framework. For machine learning, designers can use popular frameworks including Caffe to train neural networks. Within one Xilinx Zynq SoC or Zynq UltraScale+ MPSoC, a Caffe-generated .prototxt files can be used to configure a software scheduler running on one of the device’s ARM processors to drive CNN inference accelerators—pre-optimized for and instantiated in programmable logic. For computer vision and other algorithms, the code can be profiled to identify bottlenecks and then specific functions designated for hardware acceleration. The Xilinx system-optimizing compiler then creates an accelerated implementation of the code, automatically including the required processor/accelerator interfaces (data movers) and software drivers. Initially, embedded-vision developers used the existing Xilinx Verilog and VHDL tools to develop systems, but the reVISION stack enables an even broader set of software and systems engineers to develop intelligent, highly responsive embedded-vision systems faster and more easily using FPGAs in new ways. The last two years have generated more machine-learning technology than all of the advancements over the previous 45 years and that pace isn't slowing down says Xilinx. Many new types of neural networks for vision-guided systems have emerged along with new techniques that make deployment of these neural networks much more efficient. ARM is taking aim at embedded artificial intelligence with a new architecture. The DynamIQ cluster technology will allow up to eight completely different cores to be used in a big.LITTLE style. The move is aimed at a wide range of applications, including driverless cars and automotive driver assistance systems as well as enterprise servers. This is driven by the need to have more AI processing locally, as demonstrated by the recent Jetson TX2 launch by NVIDIA. I would expect NVIDIA to be one of the major partners working with ARM on this for its own family of custom ARM-based cores. Extending cluster technology into embedded designs is at the heart of the ARM strategy for future devices, he says. “We started cluster with the ARM11 4-core cluster ten years ago, and then big.LITTLE was six years ago, and we used the CoreLink SoC [fabric] to scale these into larger systems,” said Nayampally. “DynamIQ is the next stage, complementary to the existing technology, with up to 8 cores in a single clutser to bring a larger level of performance. Every core in this cluster can be a different implementation and a different core and that brings substantially higher levels of performance and flexibility. Along with this we have an optimised memory sub system with faster access and power saving features,” he said. This would allow several small cores and several large cores to operate independently and switch code between the different cores depending on the processing requirements. “For example, 1+3 or 1+7 DynamIQ big.LITTLE configurations with substantially more granular and optimal control are now possible. This boosts innovation in SoCs designed with right-sized compute with heterogeneous processing that deliver meaningful AI performance at the device itself,” he said. Announcements on partners and cores for DynamIQ are expected later this year with early silicon in 2018. ZTE is pushing low power wide area network technologies for the Internet of the Things. It has teamed up with the China LoRa Application Alliance (CLAA) to launch a shared, co-built carrier-class IoT network. It has also launched the second generation of its Smart Street LPWAN network technology for smart city applications. The CLAA deal provides an industrial grade IoT gateway and cloud-based core network, long range/low power (LoRa) chips/modules, intelligent IoT terminals and mature solutions together with 3D dynamic joint service provision. This is aimed at providing access over the last kilometre with low power consumption, low costs and long-distance deep coverage. Since its foundation at the end of January 2016, the ZTE-initiated CLAA has developed into an alliance with over 500 members, displaying exceptionally fast growth. Its members include not only network enterprises which manufacture chips, devices, platforms, antennas and batteries, but also a large number of application vendors around the world with considerable experience in the metering, industry park, municipal administration, industry, energy and agriculture fields, which can boost the LoRa industry through many applications. The CLAA has built a technology exchange platform, solution verification platform, market cooperation platform, resource interconnection platform and innovation incubation platform for Chinese LoRa applications. It has certified over 80 products from enterprises in the alliance, released more than 50 application types and launched 30 demonstrative bases for CLAA IoT applications. In addition to its deployments in the industrial chain ecosphere, ZTE is testing a new business and cooperation model in the LPWAN area, the CLAA network operates in an open, close-looped, shared and co-built way, and all CLAA members are builders, operators, users and application developers of the network. The CLAA has a unified and standard LoRa gateway, which enables standard hardware from different types of vendors to access a network and be shared. ZTE has carried out trial operations in many cities, and has now entered the phase of large-scale commercial use of IoT. More than 30 smart meter enterprises have joined the alliance and support the CLAA agreement, and over 80 percent of mainstream gas meter enterprises are formal members of the CLAA. For digital oil fields, ZTE and a number of enterprises in the alliance jointly launched a LoRa technology–based production monitoring system, which can implement remote intelligent data collection and control. Compared with traditional models, this system has slashed the comprehensive construction cost and has been demonstrated in a large oil field deployment. Smart Street 2.0 combines IoT, cloud computing platform and Big Data technologies for key services such as parking and lighting. The heart of the Smart Street 2.0 solution is the centralised ‘street command & control centre, which acts as the main back-end hub for the street applications. It interacts with smart street IoT infrastructure and collects data from the sub-systems. It then uses a Big Data analytics engine to interact with citizens via a smart phone app to provide notifications, guidance, navigation and smart routing information. It also collects payment fees for smart parking as well as other fee collections, such as traffic violation ticket charges through online payment services. Functions like smart parking shows the real-time acquisition of available parking spaces in the street and in the vicinity of drivers, providing navigation and online payment fee facility. Smart street lights operate intelligently based on factors such as the time of the day, natural light conditions and weather. The automatic sensor technology script in the street command and control centre helps to automatically switch lights on and off or brighten/dim as per the real-time environmental conditions, natural requirements and street activity. Smart street LED displays can show weather, temperature, noise and other important information and can also be used for displaying public information and advertisements. The sensors also sense the volume of waste and report to the back-end system. When 80 percent capacity is reached, an automatic ‘waste pickup signal’ is sent to the back-end system, which in turn notifies the trash truck driver. It also navigates the waste collection vehicle driver to the pickup points using the most efficient route, creating a dynamic schedule for multiple waste collections in the area.